Sift flour, cornflour and icing sugar into a mixing bowl. Add butter to the flour mixture, and rub with your fingertips till the mixture resembles breadcrumbs. Add the yellow colouring to the egg yolks, and mix well. Add the egg yolks to the flour mixture bit by bit to form a dough that does not stick to the mixing bowl. Shape into a ball and let it rest for 20 minutes. Divide the dough into two. Take one batch and roll to a thickness of 0.5cm between two pieces of cling film. Cut out circles on the rolled out pastry with your favourite tart cutter. Make sure to grease the sides of the mould. Arrange on the baking tray, and repeat with the second batch. Roll the jam filling into thumb-sized circles, and place them on the pastry rounds. Bake them in an oven preheated at 175°C for 25 minutes. After 10 minutes, rotate the baking trays so the tarts will be baked evenly. 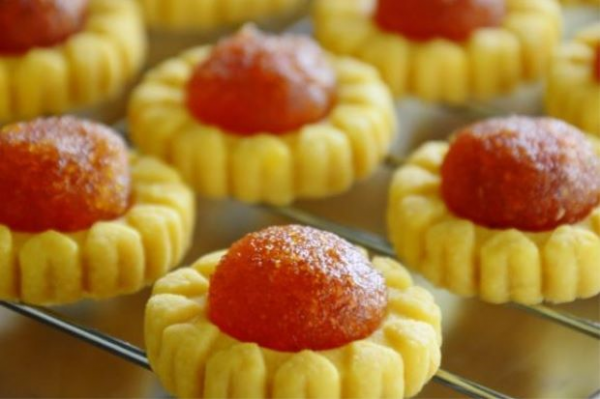 Cool on a rack and store the tarts in airtight containers. Put the pineapple and sugar in a wok, mix well and cook till mixture boils. Keep stirring till the mixture thickens. Add orange pulp, reduce the heat to medium and continue stirring. Finally, add the chopped apples. Mix well and stir till the mixture becomes glossy. Turn off the heat, and let it cool. Then, shape into thumb-sized balls for the tart filling.